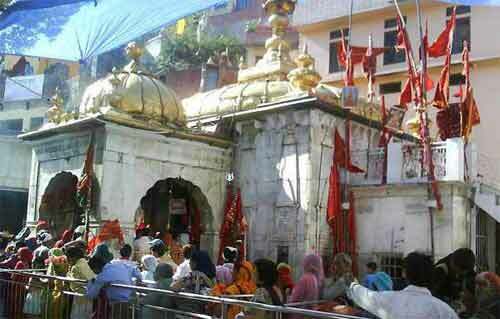 Jawalamukhi Temple located in Kangra District in Himachal Pradesh is one among the Shakti Peethas. Legend has it that the tongue of Sati (Shakti) fell here when Lord Vishnu cut the dead body of Sati into pieces to pacify Lord Shiva. Jwala Ji Chaitra Navratri Mela is one of the important fair held here. Jwalamukhi Temple Chaitra Navratri Mela 2019 date - April 6 to April 14. This unique temple, also referred as Jawalaji, does not have an idol instead there are nine flames burning continuously from the fissures in the temple. Since the Goddess is worshipped in the form of celestial flame she is known as Jawalamukhi. Nobody has been able to recognize the fuel source of the sacred flame. Nearly half a million devotees from Himachal Pradesh, Punjab, Chandigarh, Haryana, Uttar Pradesh, Rajasthan and other parts of India arrive at Jawalamukhi temple during the Chaitra Navratri mela or Vasant Navratri festival. Chaitra Navratri is the Durga Puja during the spring season. It is observed mainly in North India for nine days. In fact, most of the Devi temples in Himachal Pradesh conduct the Chaitra Navratri fair and festival.